We’ve now had our solar panels for 1 year, so it would seem time for an update on how things are going. Our 4kW SSE-facing system has an expected annual generation of 3,668 kWh. However after a year in service I’m pleased to see that we’ve generated 4,056 kWh – 10% more than expected. 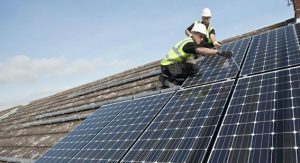 The financial returns on a solar PV system are a combination of 2 things: (i) payments from your chosen electricity company for energy generated and exported to the grid and (ii) savings from not having to buy so much power as you use that which you’ve generated instead. When it comes to payments from the electricity company, my electricity company (like many) chooses not to go to the expense of installing an export meter and instead assumes that half of the power which I generate is exported to the grid. The total annual revenue for the first 12 months of operation, including both generation and export (assumed to be 50% of generation) is £629.62. Then there’s the question of how much electricity I save. I’ve only had monitoring of usage since March (approximately 6 months) but in that time I’ve used 41% of the generated electricity to replace bought electricity. 41% of 4,056 kWh is 1,663 kWh. What is less clear, is what the unit saving for this energy is. 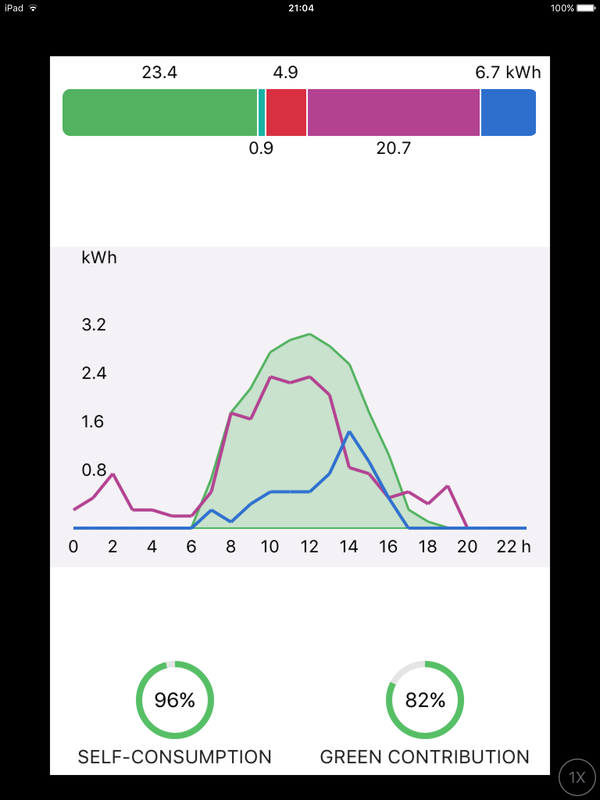 Some of this is daytime usage like standby loads, the fridge, cooker and other daytime loads at 11.7 p/kWh; but some would otherwise be night time loads like dishwasher, washing machine, or car charging at 7.57 p/kWh. I don’t measure the split so I’m simply going to assume an average unit rate = (11.7 + 7.57)/2 p/kWh = 9.6 p/kWh. 1,663 kWh @ 9.6 p/kWh = £159.65. Finally, there’s the question of how much gas I save by making hot water from solar PV electricity rather than gas. Since March I’ve used 813 kWh or 27% of the generated power for water heating, so for a whole year 27% of 4,056 kWh is 1,095 kWh. The immerSUN itself records 995 kWh used for water heating since December. I’m also going to assume that not all the heat from the gas boiler would have ended up in the tank as hot water since some is lost via the boiler flue to the outside world, and some is lost via the pipes to the inside of the house – so let’s say 80% efficient on gas. 1,095 kWh @ 3.01 p/kWh @ 80% efficient = £41.20. The combined total of my revenue and savings for a whole year would have been £830.46 – a 13.6% return on the investment or payback in 7.3 years. 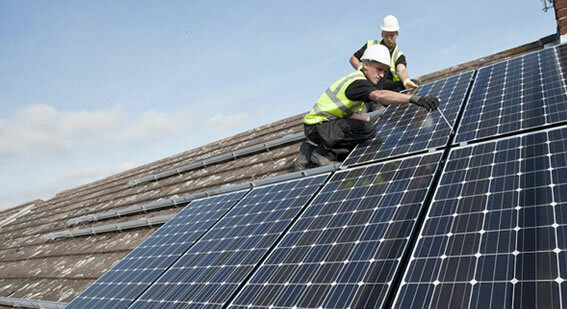 The tariff scheme will have provided me with about 20 years of income by the time it closes, so the investment in the panels, as well as helping me reduce my carbon footprint, will have generated 12+ years of profit having paid for itself during the 8th year. This entry was posted in Charger control project, Solar PV, Water heating on 25/09/2016 by Greening Me. Today I read a number of comments elsewhere from those who didn’t think it was possible to run an electric vehicle in the UK with a ‘significant’ degree of solar charging. I’m not sure how they come to that conclusion when some of us are doing it. Now clearly the vehicle needs to be home, sometimes, and there’s a limit to how much can be generated; but it certainly works for me. I average around 20 miles per day, which is about 6 kWh of electricity; but my average daily generation is 11 kWh. That’s clearly seasonal, so I doubt that I can solar charge through the depths of winter – November to January I don’t generate 6 kWh on average let alone have 6 kWh available for EV charging. It needs a certain mindset. I think most EV users try to get a full charge when they charge but many go for several days between charges. With solar charging I try to ensure that I have enough charge on board for the day ahead (potentially charging a little overnight to achieve this when necessary), but on a sunny day with the car at home I can get a full charge during the day. I only try to get a full charge by the start of a day on imported electricity when I know I’m going on a relatively lengthy trip, otherwise I deliberately don’t aim for a full charge to leave space for solar input if available. Whenever the car is at home it’s plugged in ready for when the sun shines. Typically I’ll leave the weekend with the vehicle almost fully charged (1 full day of sunshine can get a full charge), that will drift a bit during the week, possibly benefitting from a day at home during the week if I have meetings in London, then by the weekend it’s almost empty. Top-ups during the week (at least during the summer) are often before I leave for work in the overlap where I have some solar (but not enough to run the charger) but am also in the Economy 7 window. Overall I think that I have a good claim that most of the electricity for charging comes from my own solar during the course of a year. This entry was posted in Charger control project on 11/09/2016 by Greening Me.